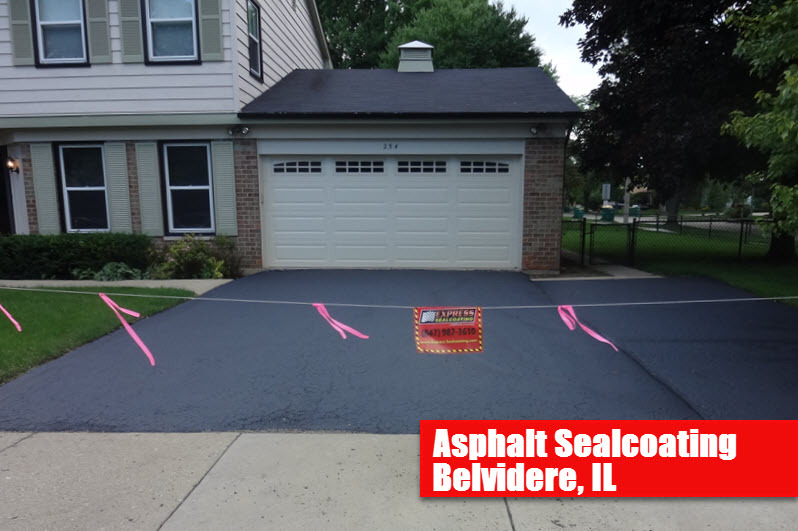 We have competed 1000’s of asphalt seal coating projects all across Belvidere IL and greater Chicago area for residential, commercial, and municipal customers during our 40+ years in business. We serve the greater Chicago area for Commercial asphalt maintenance and Residential sealcoating and we constantly strive to bring the best possible workmanship possible while still maintaining competitive pricing for our all of our clients. We do more than just driveway sealcoating in Belvidere IL. If you need some specialized service or asphalt repairs we can give you a free estimate to sealcoat or repair part or ALL of your driveway. We offer line striping services for parking lots including new layouts, sealcoating, or restriping using the highest quality paint products available. We are very experienced in repairing drainage and sewer problems which require different solutions depending on the specific needs and grading issues. Our Asphalt sealcoating and driveway sealcoating services in Belvidere IL include treating Oil spots using a propane torch to lightly dry out the oil and then apply a high grade oil primer to improve adhesion of the sealcoating. Neatly brush apply 1 coat of 100% the highest quality Coal Tar sealer manufactured by Gem Seal, formerly Sakrete. (Silica sand is evenly mixed with the sealer for added Traction and Durability). Thorough cleaning of the entire asphalt surface and in cracks using wire broom to loosen up dried dirt and debris and then high powered blowers to clean off all dirt and debris. Belvidere’s Top Asphalt Sealcoating Company!